Lesley Allan traversing slopes northeast of Grindstone’s summit. Everyone says I’m indecisive, but I’m not so sure about that. When I have a day off it’s simply hard to decide which local hike to pursue because there are so many choices. 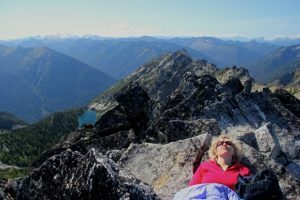 Should I: hike to a lovely lake; hike off-trail for a route-finding challenge; scramble up a peak for views; hike an established trail so both my feet and mind can wander; or should I hike a loop so every step of the route exposes me to new terrain? 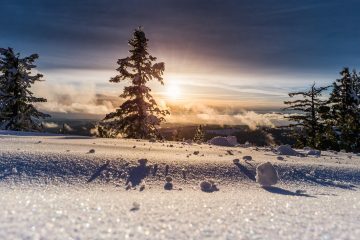 Once in a while you get a hike that incorporates all of these qualities into one effort. On a cool September morning last year, Lesley Allan and I drove nearly to the end of the Icicle River Road (access and hiking details below) and arrived at our trailhead at the leisurely hour of 8 a.m. It was a Sunday but we still had the little parking area to ourselves as we laced up our boots. Because the exit for our hike would come down the Chatter Creek Trail, which we had passed several miles back, we thought about stashing a mountain bike at the Chatter Creek Trailhead. But because I’m decisive, I definitely decided we shouldn’t leave a bike and that we should hitchhike back to the car when we returned to the Icicle Creek Road later in the day. Soaking up the sun below Grindstone Mountain. the lake got down to business. Up it went along a wooded ridge with virtually no breaks to relieve its relentless gain. In less than 2 miles of hiking the fisherman’s trail to Sylvester Lake gains 2900 vertical feet. Of course, when the objective is to gain elevation, a trail that actually climbs quickly rather than zig-zags forever is welcomed. Speaking about a fisherman’s trail, as we hiked up, we were passed by an off-duty Forest Service ranger armed with a pole and other such accouterments. After a short chat, I asked him how good the fishing was up there. “Ahhh,” he hesitated, “I’m not saying.” For not saying anything, he said a lot. Route finding was easy until we intersected boulder fields. Here I decisively led us too high and got cliffed-out. Indecisively we backtracked a little and found a suitable path without much bushwhacking pain. For me, route finding and off-trail hiking add to the fun of an outing. Lesley is less-enthralled about returning home with scratched shins and forearms full of thistles, so we don’t always agree on what constitutes a fabulous outing. 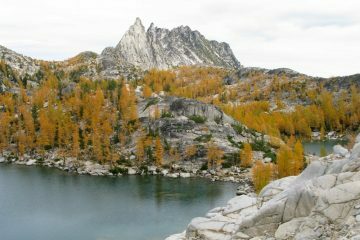 We soon reached the large lovely mountain lake, named not for the Warner Brothers feline, but for A. Hal Sylvester, the first supervisor of the Wenatchee National Forest. More information about Hal Sylvester can be found in the excellent book by Chester Marler, East of the Divide. It was nearly noon, and we made our way to the head of the lake and a large flat boulder — a perfect spot for lunch. On prior mid-summer hikes to Sylvester Lake, we’ve enjoyed swims in the ‘refreshing’ water pooled below Grindstone Mountain. Today, after a relaxing lunch, we opted to forego the swim in exchange for a 1300-vertical-foot climb to the summit of Grindstone. With few trees to obstruct our vision, the route-finding on the steep ground leading upward was easy but boulder strewn. Nothing like a quick wink on the summit to restore you for the descent. Looking back and watching the lake shrink gave a great sense of our progress. We topped out about 3 p.m. and did what everyone does on a summit: ate, rested, took pictures, and enjoyed the views. The views of the sheer Chiwaukum Mountains to the north and to Mount Rainier hovering above the horizon to the south were particularly spectacular. Such views reinforce what a wonderful world Central Washington is – they also let us play the peak-identification game. We identified the peaks as best we could, then moved to the NE edge of the summit where we could look down on the Chatter Creek Trail, the next objective along our route. We went north off the top and angled slightly east along the west side of the ridge leading to a low notch. Lesley found the footing tricky but manageable. After reaching that notch, we followed a gully dropping off the opposite side that delivered us safely down to the Chatter Creek Trail. It was now 6 p.m. and, given the shorter autumn days, it was especially nice to do the last 3.5 miles of the route on a regular trail. We arrived at the Chatter Creek Trailhead well after dark, and Lesley found a tree to lean against while I walked the road to retrieve the truck. Naturally, not a single car was headed my way so I hoofed it rather than hitched it. I kicked myself during those final 3 miles for not stashing a mountain bike to make this part of the outing pleasant. Instead, pain was the fruit of being decisive about hitching. Distance: Roughly 8 miles (excluding the extra 3 miles of road at the end). The route will feel much longer than this because much of the way is not easy trail walking. Skill: Because of the route finding, rock hopping, brush, and scrambling this is an advanced hike (difficulty of 3 or 3+). From a climbing/mountaineering perspective, the route is non-technical (no true rock climbing, no ropes necessary, etc.) and is rated a 1+ (advanced beginner). Access. Start by driving nearly to the end of the Icicle River Road. Make a right turn, just before crossing a bridge over the Icicle, next to the Rock Island Campground on an unnamed dirt road (Green Trails map marks this as FS road #7609) with a sign “road ends in 1 mile” and drive all the way to the end (a hair longer than one mile). This final mile is easily driven, but overhanging brush will rub the side of your car. No signs mark the end, but it’s obvious where no further progress can be made. Parking is possible for about three vehicles. Usually you’ll have the place to yourself. From the parking area, begin by going NE away from the Icicle River on an obvious unofficial fisherman’s trail. It quickly bends left through overhanging branches and crosses a few low berms on an abandoned road. In only a few minutes it takes off steeply uphill to the right, heading NE. 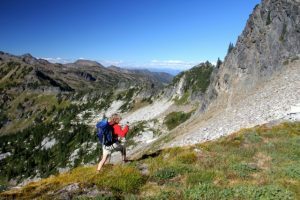 The path is easy to follow initially as it climbs, often steeply and almost always consistently, although a couple of areas of deadfall and thick grass can occasionally be confusing. Eventually traverses a slope, with the valley marked Grindstone Creek on Green Trails Map 177 below to the left, and hits boulder fields. Cairns will help you stay on track although attention is required as it is easy to get disoriented. At one point the route drops down thru brush a short distance, counter-intuitive to what you’d expect, but sleuthing usually picks up the route readily – of course, it is not necessary to go a certain exact path anyway as long as the direction of travel makes sense. Going too high too fast may necessitate backtracking to avoid cliffs. The cairned path through the boulder field tops out on a low rocky ridge. Ahead lies a small valley with a stream. 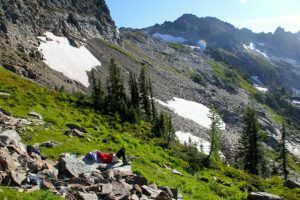 Lose a little elevation and drop to the stream, head upstream a bit and then begin ascending the ridge line to the north – Sylvester Lake is on the other side of that ridge. This last part lacks any specific path, just follow your nose, consult your topo map, and apply common sense to head up and over to the lake. Grindstone is now directly above the head of the lake. Navigating is easy on this section. Just follow the path of least of resistance to avoid cliffy areas and to visit the clumps of flowers you find the prettiest. Top out on the lovely summit. The maintained Chatter Creek Trail is visible below, and the last challenge is to make your way safely down to it. One way, as Lesley and I did, is to cross over the top of Grindstone, angle NE to the ridge extending north and travel due north along it’s west side until finding a safe notch to cross over and a non-technical scramble down to the trail. Although the going is steep and slow through here, if it looks downright dangerous keep poking around the various notches to find and easier scramble down. 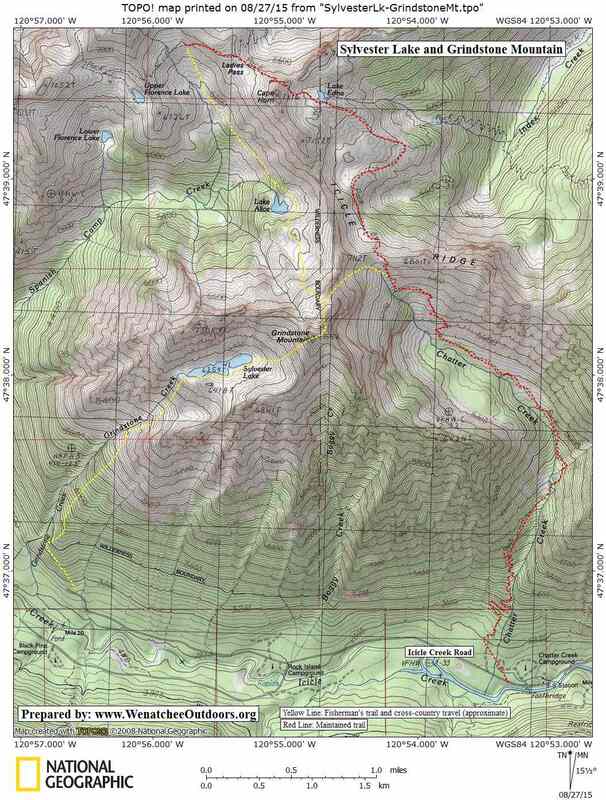 Although I have not done this, the map indicates there is a safe way to drop directly off the summit heading ENE down to the Chatter Creek Trail. In high snow years or early season the descent route could easily require ice axe and crampons. 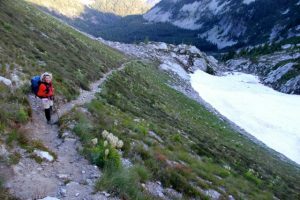 A longer descent for fast travelers that covers more ground in this beautiful alpine country is to drop off Grindstone and hug the high terrain on the west side of the ridge that extends north off the summit and leads to Ladies Pass. Pick up the official trail near Ladies Pass. The Chatter Creek Trail offers a straightforward march down and out of the area. A good reason to do this hike as described (clockwise, heading to the lake first) is that if fatigued or if headlights are needed, you’ve done the challenging route finding first and can hike out like a zombie on a good trail. Our pace was unhurried, and many will make faster progress than we did. 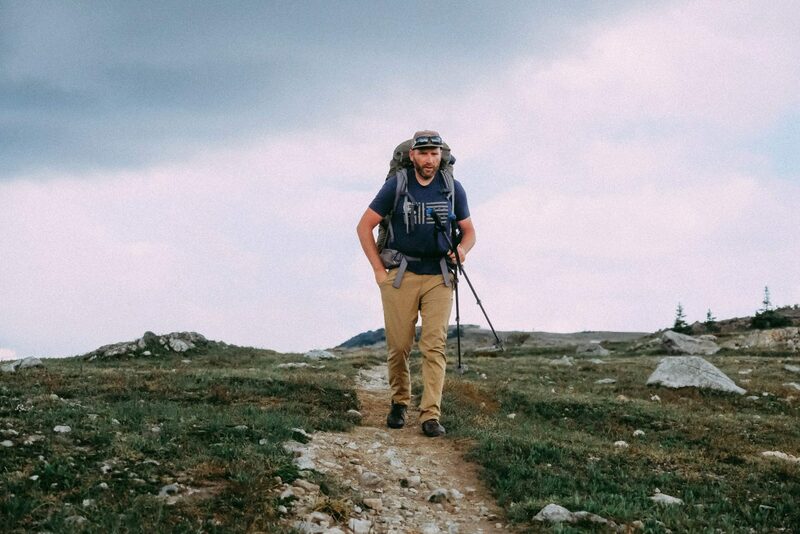 Build in time for route finding, lake dipping, and summit enjoyment. Map: See our topo map. Permits. If you leave a car at the Chatter Creek Trailhead you’ll need a Northwest Forest Pass. This post was originally published on 9/1/15.